Twenty-six magical images gleaned from almost two hundred wood engravings made by George A. Walker for extremely rare editions of Lewis Carroll’s Alice’s Adventures in Wonderland and Through the Looking Glass (And What Alice Found There) published by Cheshire Cat Press in 1988 and 1998, respectively. Nineteen year old George A. Walker was a first year student at the Ontario College of Art when he met O C A printmaking instructor Bill Poole in 1980. For some time Bill had it in mind that he wanted to make a hand-printed edition of the ‘Alice’ books. After a few months’ acquaintance with his student’s work ethic and unique image vocabulary, Poole decided that George would be the perfect artist to illustrate them! Bill somehow managed to convince young George of the grandeur of his vision. Then all that was required was for George to teach himself how to engrave on wood as that was the traditional way to print images alongside hand-set text. 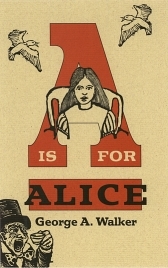 The project evolved into a ten-year collaboration between Joe Brabant (a member of the Lewis Carroll Society), Bill Poole, and George Walker, the goal of which was to publish the first Canadian edition of Alice in Wonderland, with Joe acting as editor, George as engraver, and Bill as typesetter and printer. On completion of the the first volume, the three then started in on Through the Looking Glass, which took an additional ten years to complete! ‘Alice in Wonderland has inspired the imaginations of generations of readers, writers, and artists the world over. In A Is for Alice, the visceral merriment and eccentricity at play in Lewis Carroll’s original masterwork shine brightly. Via twenty-six of his intricate wood engravings on the subject (which number close to an amazing two hundred), expert bookmaker and printer George A. Walker offers a glimpse of some of the most memorable moments and characters of Wonderland fame. ‘The book’s release is a mere three months before the highly anticipated blockbuster Return to Wonderland; while this may be fortuitous timing, A Is for Alice is strikingly different from Tim Burton’s prismatic feature. Walker’s Wonderland is captured in bold slashes -- stark, physical renderings of movement and emotion in solid wood. Each image offered here provides evidence of its creation; there is a reminder, with each turn of the page, of the hand and thought that guided each groove. Walker’s ability to impress such great detail (as in the grain of both the fur of the Cheshire Cat, and the branch upon which he is perched) in a print made with woodblocks is remarkable, and is a testament to the quarter-century Walker has dedicated to creating books. ‘The author’s careful selection of passages and images encourages readers to take as little or as much time with the text as they wish. The woodcut images themselves provide plenty to ponder (feeling at times to be actual snapshots of the fantastic and bizarre heroine’s journey) and the alphabetical layout offers similarly brief, yet telling, almost anecdotal-feeling narrative. Carroll’s charm is ever-present in Walker’s playful choices for the letter’s representatives, ranging from the understated ‘C is for Caterpillar’ to the ‘U is for the Jack (Knave) Under Arrest.’ Wonderland is nothing if not a realm of wordplay, and Walker successfully continues the game. George A. Walker (Canadian, b. 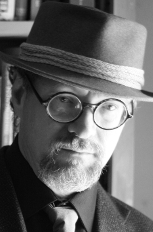 1960) is an award-winning wood engraver, book artist, teacher, author and illustrator who has been creating artwork and books, and publishing at his private press since 1984. Walker’s popular courses in book arts and printmaking at the Ontario College of Art and Design in Toronto, where he is Associate Professor, have been offered continuously since 1985. For over twenty years Walker has exhibited his wood engravings and limited edition books internationally, often in association with The Loving Society of Letterpress (and The Binders of Infinite Love) and the Canadian Bookbinders and Book Artists Guild ( C B B A G ). Among many other book projects, Walker has also illustrated two hand-printed books written by the British author Neil Gaiman. Walker is the illustrator of the first Canadian edition of Lewis Carroll’s Alice In Wonderland and Alice Through the Looking Glass books (Cheshire Cat Press). George A. Walker was elected to the Royal Canadian Academy of Art for his contribution to the cultural area of Book Arts. ‘Here is the book that Alice herself would have loved, with wonderfully whimsical illustrations by one of Canada’s greatest woodcut artists, George Walker. ‘George became well known for his depictions of Lewis Carroll’s characters from his previously illustrated Alice’s Adventures In Wonderland and Through The Looking Glass. George has beautifully brought to life his own unique versions of the incredible creatures who inhabit Alice’s worlds.